On March 20th, Target announced its plans to expand in Manhattan. According to the company that has more than 1,800 stores at the moment, they are planning to open a small-format store in Herald Square, near the intersection of Broadway and 34th street. Target is going to open about 30 stores this year, including the one on Herald Square. 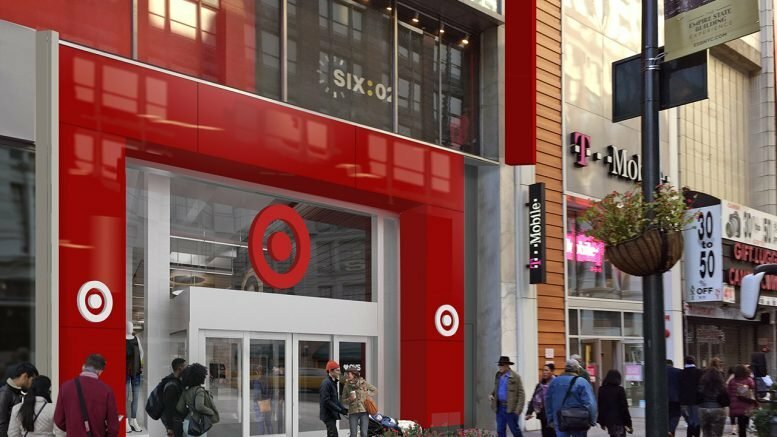 This will be the third Target store location in Manhattan, along with Tribeca and Harlem stores. The size of the store is 43,000 square feet, and Target has signed a lease for it with Empire State Realty Trust. The modern design of the store will include wood plank ceilings and walls, LED lighting and displays showing elevated merchandise assortment. On top of that, customers will be able to obtain prescription drugs at a CVS pharmacy that is also the part of the Target small-format store. According to Target, New York has been chosen for focused expansion with the help of small-format stores because of its dense urban neighborhoods. As for now, the New York market is a key for the company’s growth. However, customers can find local Target (CVS) pharmacies across the United States. Small-format layouts are more flexible than large stores and can be used for small locations, but they still provide the local community with the most needed goods. Shanae Ursini and Fred C. Posniak of ESRT, Ian Lerner, May Clayton and Joanne Podell of Cushman and Wakefield provided landlord representation. From Target’s side, Richard Skulnik, Jeffrey Howard and Richard Skulnik of Reco Real Estate company represented broker. Previously, the company announced their plans to open stores of this new format in East Village in 2018 and another store in Hell’s Kitchen in 2019. The Herald Square Target store will have two levels and two entrances: one off 33rd street and the other one off the 34th street. The assortment of the store will include apparel and accessories, which can be found in inspiration and style closer to the entrance off 34th street. Beverage and food will be located near the other entrance and have convenient grab-and-go service and on the lower level of the store, where customers will find grocery with a fresh assortment. People can also find apparel for the whole family, a grocery department, home items for refreshing small living space, personal care items, and health and beauty products. According to the company, Order Pickup service will allow Target customers to order the goods they need online and then just pick them up at the store without any necessity to stay in the line and spend additional time for waiting. Target said that the service was available in 325 stores as of November 2016. The company also stated that about 90% of Order Pickups would be available in an hour. Mark Schindele, Senior Vice President, said that the addition of the store was exciting for Target since they were expanding their footprint with small-format store locations in Manhattan. He also added that Target will be able not only to serve thousands of working people who walk through Herald Square every day but also will have an opportunity to show their exclusive brands and offers to a lot of tourists from around the globe who shop in Manhattan. He pointed out that Target was joining Foot Locker and Sephora at the best location on the retail corridor of 34th street. This corridor spans from the Empire State Building to 7th Avenue. In addition, Durels said that they were delighted to be partners with Target and deliver once again to shareholders the results of their embedded growth. Be the first to comment on "Target Announced New Format Store Opening to Include CVS Pharmacy in Manhattan"